I am just in the final stages of completing my new collection of Fleur de Grunge designs. These designs have been quite a challenge and it has taken me some time to develop them. However now that the first two sets are launched, and the other two are nearly finished I decided to experiment with some hot fix crystals. 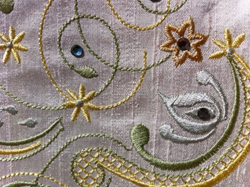 A beautiful embroidery can really come alive if the right crystals or pearls are tastefully added. Obviously it is possible to get your heated applicator wand and fix too many crystals on your embroidery and spoil it. My technique is to look through all my crystals looking for the closest matches to the threads that I have used. 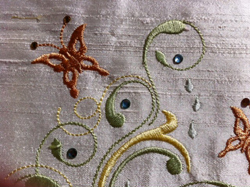 I lay out some of these crystals on the embroidery to see what looks best before attaching them. For the Fleur de Grunge designs I put some small bronze crystals on the antennae of the butterflies. I used the curves of the stitches as the perfect place for some larger green crystals. When you stitch these designs out you may use other colours and I hope you will experiment with all the crystals and pearls that are available. Be careful that you hold them in your wand for long enough for the glue to melt, before you press them onto your fabric. As a tip I always count to about 12 before I do this although the time will vary depending on the size of the crystals. Please visit my website to see the whole collection of designs. My crystals and Blue velvet fabric are waiting for me to sew and embroider using this beautiful collection. I really like the understated bling. Have to unwrap the wand and find the crystals to give it a try! Thanks so much for the tutorial on the card and also the Fleur de Grunge – inspiring to say the least. Thanks for sharing your ideas and talent with me !